Casa Nohoch (Mayan for the House of the Woman Boss) has one of the best overall views in Chac Hal Al. 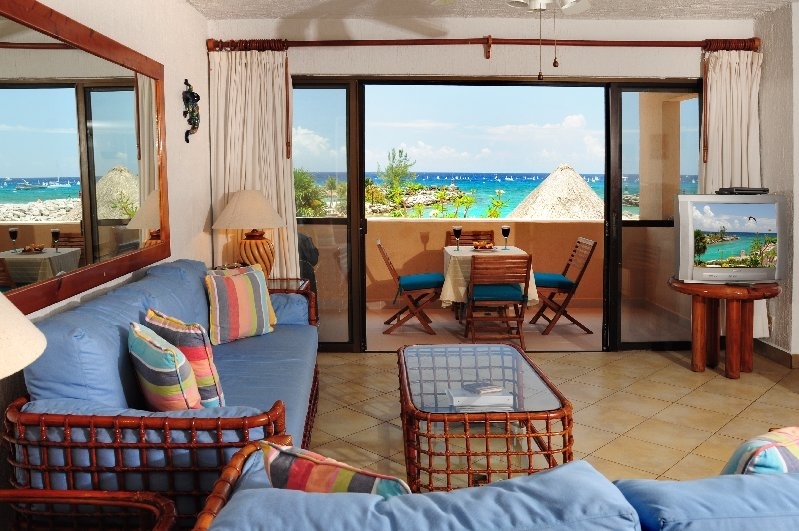 From it’s location at the entrance of the Puerto Aventuras marina, it looks down on one of the two ocean view pools. 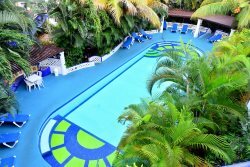 It is surrounded by beautiful landscape and a view of the ocean coastline all the way to Akumal. This first floor (not ground floor) studio condominium provides all the amenities to create a relaxing, romantic, beachfront getaway. The new infinity swimming pool and a private Chac Hal Al beach area is just a few steps away. The condominium has central air conditioning and ceiling fans for your comfort but screens on the front door and terrace allow you to enjoy the natural ocean breezes as an alternative to air conditioning. The living room opens by sliding glass door onto a large walled terrace that makes it safe for small children. The view from the terrace allows you to enjoy the ocean view while watching the fishing boats and yachts come and go. Relax with a margarita and enjoy your front row seat as the sun sets across Fatima Bay. It’s breathtaking. Get a glimpse of the cruise ships (lit up at night) on the horizon as they make their way to and from Cozumel. Marvel at the flocks of Pelicans and other Yucatan bird life. It’ nature at it’s best. A gas grill is located on this terrace for cooking the “catch of the day”. Other living room amenities include cable television with a DVD, a CD stereo, and the owners provide you with wireless internet connection for your convenience. If you, your family and friends sign up for Skype before you leave home, you’ll be able to talk to them for free—no expansive phone calls. So bring your own laptop with your head sets. The living room sofa is suitable for a small child to sleep on or a roll-away bed stored in the closet, offers the extra sleeping capacity. A Trump de Oie mural of Fatima Bay by renowned Mexican artist Cesar Ventura, decorates the wall over the king-sized bed in the alcove off the living room. The large open kitchen is fully equipped with two burner electric stove top, toaster oven, microwave, coffee maker, blender, cookware/utensils/place-settings and full sized refrigerator. A washer/dryer is located against the wall. we provide purified bottled water throughout your stay. A small floor safe for your valuables is located in the large walk-in closet as is an ironing board/iron and a hair dryer. The bathroom has traditional Mexican Talavera tiles and sink. Complimentary luxury toiletries are provided upon arrival plus a hairdryer. Linens, bath and beach towels are furnished in the apartment. Casa Nohoch is very comfortable. The location is quiet and perfect for those who want to enjoy the ocean and garden views. It’s just a short walk to the commercial area with restaurants, boutiques, dolphin discovery, fishing, scuba diving, parasailing and so much more! Golf and Tennis are on the premises. You will enjoy maid service once during a weeks stay.